Everyone who has played No Man’s Sky wants to get to the center of the universe. The universe in question is the one that is procedurally generated for each player that logs into No Man’s Sky’s world. Make no mistake, No Man’s Sky has a virtually infinite game world. One of the tasks the game gives you in the beginning is related to reaching the center of the universe. If you accept that challenge then know, that you have a long and arduous journey ahead of you. Thousands of No Man’s Sky players have spent countless hours in trying to figure out the most efficient way to get to the center of the universe. Not only that but players have also tried to understand the mechanics of other gameplay features. Now, people know the quickest ways to make money in No Man’s Sky. There are whole guides that are aimed at No Man’s Sky beginners that teach newbies on how to survive in the harsh world of No Man’s Sky. But, if you’re one of those players who have little interest in building an empire in No Man’s Sky and would rather reach the center of the universe as quickly as possible, without using any cheats of course, then this guide is for you. Before we dive deep into how to reach the center of the universe quickly and without cheats, you should know that No Man’s Sky is not everyone’s cup of tea. The game, sometimes, requires you to be super patient and willing to grind through ton of hours collecting tons of minerals and other stuff to get your upgrades which are vital to your chances of reaching the center of the universe. The game currently has an overall rating of 45% on steam and has about 25000 upvotes. But those 25,000 upvotes are all canceled out by the 32,000 downvotes. The major reason why players have not liked No Man’s Sky is because of their own expectations. You should never rate a game based on what you want the game to be. You should always rate a game as it is presented to you. With that said, we don’t buy Sean Murray’s claim that Playstation Neo would fundamentally change No Man’s Sky’s experience. We think that the game would remain the same no matter if you’re playing it on Xbox One or on a PC monster gaming rig with two GTX 1080. To be fair to No Man’s Sky team, the founder of Hello Games (Hello Games is the studio behind the development of No Man’s Sky) Sean Murray did state, before the game had launched, that he expected the game to be super divisive. And divisive it has been since, as mentioned before, it has an overall rating of 45% on steam. Hello Games has tried to address the issues faced by both PC and Playstation players by releasing a number of patches but so far, none of those patches have improved the features of the space exploration game. In short, the game has not delivered fully on the expectations people had of it and has a number of compatibility issues especially on its PC port. If you still want to tough it out and reach the center of the universe then read on as we’ll list all the ways you can fast track your progress towards No Man’s Sky’s center. Simply put: if you want to get to the center of the universe, you won’t be spending too much time exploring the 18 quintillion planets the game has in store for you. All you’ll do is to look for ways which will get you to the center of the universe quickly without the use of any exploits or cheats. To do that, it is important if not imperative that you choose to follow the Atlas quest line. Various players have reported that the Atlas quest line is the best and most efficient way to accomplish the goal of reaching the center of the universe in No Man’s Sky. Step 2: You Must Craft And Charge Your No Man’s Sky Ship’s Hyperdrive. Are you ready for the center of the universe in No Man’s Sky? There is no easy way to say this, but if you want to kick off your campaign towards the center of the universe in the game then you need to get yourself a hyperdrive as soon as possible. More specifically, you need your starship’s hyperdrive up and running in the least amount of time. The processes of acquiring a hyperdrive will start as soon as you begin the game. Read that sentence again if you didn’t pay close enough attention to it. The first few minutes that you spend in No Man’s Sky are absolutely crucial in how quickly you’ll be able to reach the center of the universe. In the beginning of the game, you’ll have to repair your ship. After you have gathered enough material and repaired your ship, the game will require you to leave your first planet. And that is exactly what you will do. When you will enter space for the first time in the game, an indicator (or marker) will highlight the location of an outpost on a nearby planet. You must direct your starship to the marked outpost and find the alien who will provide you with a recipe for the hyperdrive. Both are relatively easy to bag. You should be able to buy a Dynamic Resonator by visiting a Galactic Trade Terminal and looking for it. As far as the Heridium part is concerned: you can get lots of Heridium on nearby planets. Almost all planets have Heridium lying around somewhere. All you really need to do is to look hard enough. Once you are done with crafting the hyperdrive with the required materials for your starship, you will also need a Warp Cell in order to power the hyperdrive. Now, as with everything else in No Man’s Sky, you will need to craft some Warp Cells. You can easily craft Warp Cells with 100 Thamium9 and an Antimatter. No need to worry about finding Thamium9 as this item can be easily mined from asteroids that are floating around in space. You can get an Antimatter for free if you visit the right alien that is present at an outpost that the game will direct you to. If that’s not your thing, then you can just go all out and buy Antimatter from the Galactic Trade Terminal. The Antimatter will cost you around 20,000 units so, you’ll need to spend quite a bit of time gathering that amount of currency in No Man’s Sky. So we’ve established that the Warp Cell is a fundamental item that you need to power up your hyperdrive. And since you need an Antimatter do craft a Warp Cell, this makes the whole process just a little bit more difficult than usual. As mentioned before, if you have enough money to throw away, you can buy an Antimatter from the Galactic Trade Terminal for 20,000 units. You can probably judge for yourself that 20,000 units are a lot of money and the reason why the Antimatter costs so much is that it is a very rare material. However, the scenario is completely different if you can somehow find the recipe for Antimatter as the recipe will enable you to craft the Antimatter for free. Finding the formula for an Antimatter will take a lot of work but we promise you that in the end, it will be well worth your time and effort. You can quickly find the Antimatter recipe by trailing the various markers located on nearby planets. The markers will be made visible to you after you have used the starship’s hyperdrive for the first time in No Man’s Sky. The interesting part is that, one of these markers will guide you towards an outpost with an alien. If you have arrived at the correct outpost and have met the precise alien then that alien will give you the recipe for Antimatter free of charge. The bad news is that you will need another recipe to craft an Electron Vapor. Again, you can find the required recipe by following the markers which will lead you to an outpost. For the Electron Vapor, you will need a Suspension Fluid and 100 units of Plutonium. You will need to concentrate hard here since the process is about to get a bit lengthy. For the Suspension Fluid, you will need another recipe which will enable you to craft the item. This is a good time to mention that No Man’s Sky will give you the option of either buying Suspension Fluid or be searching for the recipe to craft it. The Suspension Fluid will cost you upwards of 20,000 units per unit. If you don’t happen to have the required amount of money, you can do what you did with the previous two recipes. Follow the markers that lead to an outpost. The problem with Suspension Fluid is that, there are no markers in the game that will highlight its whereabouts. All you can do is thoroughly search all outposts of each nearby planet. You should be able to find the recipe with some hard work. The good news is that once you have obtained the recipe for Suspension Fluid, you’ll have at your disposal all the components required to craft an Antimatter item at a convenient time. If you upgrade your hyperdrive, you can travel 300 light years on each fuel cell instead of the normal 100. All you need to do is earn the Warp Reactor V1 upgrade for the hyperdrive. There are two ways to do that. One method is to talk to a lot of aliens that are present at space stations. No Man’s Sky will serve you with multiple choice dialogue series when you speak to an alien. You need to make sure that you select the option which is the most hazardous to your security. For example, if an alien requests to perform experiment on you, then you let the alien do what it wants. In a worst-case scenario, you’ll end up losing some health or maybe some currency units. However, if the experiment goes smoothly enough, the alien will reward you with the Warp Reactor V1. The second way to acquire the Warp Reactor V1 upgrade is to examine pods of Damaged Machinery that is randomly dispersed on the planet. This method will require you to do more work though. These hidden supply units of leftover technology reward you with random upgrades which are mostly related to your ship. If you’re fortunate enough, you can stumble upon one that remunerates you with the Warp Reactor V1. To speed up the process, fly near the surface of the planet when searching for Damaged Machinery. Black smoke and blinking blue lights (from pieces of machinery) are your signals for where you should search. When you make some kind of progression in No Man’s Sky, the game will alert you of Space Anomalies. In appearance, a Space Anomaly looks like a Death Star space station. Space Anomalies will pop up throughout the game at random times and locations. When they do show up, you need to land your ship into one and speak to the alien present there. You must select “resume the path of the Atlas” so that you’re guided to an Atlas Interruption event. That will progress you further in the game. This might sound counter-intuitive but if you keep on opting for the “resuming the path of the atlas” option for each space anomaly you encounter, you’ll reach the center of the universe much faster. Just take our word for it and don’t attempt to sell Atlas stones if you happen to come across one. 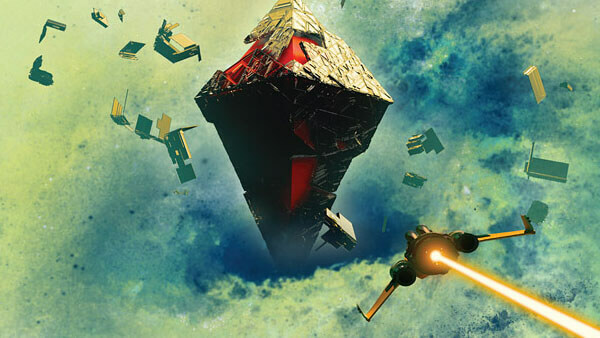 You can find Atlas Stones inside Atlas Stations that are spread through the No Man’s Sky’s universe. But I don’t want to reach the center of the universe. it’s your choice. This article is for those who do want to reach the center of the universe.